Happened to think that it is just about time that I dropped a few more lines to you. I was in a French home the other night and was asked to sit down. Now there is nothing wrong with being asked to sit down, but the expression itself was funny to me. 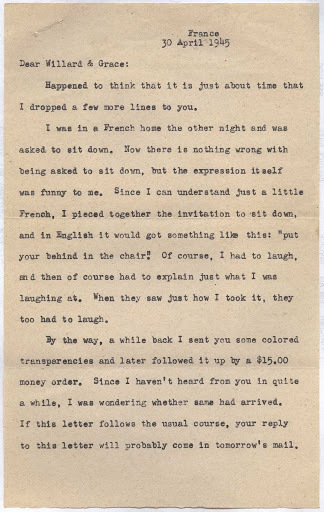 Since I can understand just a little French, I pieced together the invitation to sit down and in English it would go something like this “put your behind in the chair”. Of course I had to laugh, and then of course had to explain just what I was laughing at. When they saw just how I took it, they too had to laugh. 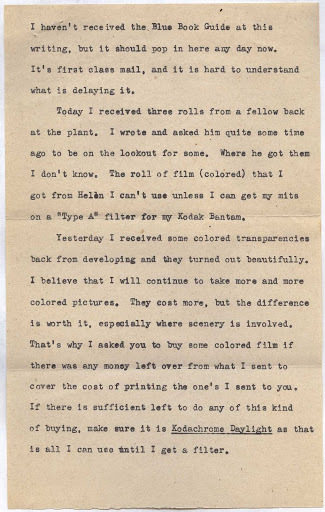 By the way, a while back I sent you some colored transparencies and later followed it up by a $15.00 money order. Since I haven’t heard from you in quite a while, I was wondering whether same had arrived. If this letter follows the usual course, your reply to this letter will probably come in tomorrow’s mail. I haven’t received the Blue Book Guide at this writing, but it should pop in here any day now. It’s first class mail, and it is hard to understand what is delaying it. Today I received three rolls from a fellow back at the plant. I wrote and asked him quite some time ago to be on the lookout for some. Where he got them I don’t know. The roll of film (colored) that I got from Helen I can’t use unless I can get my mitts on a “Type A” filter for my Kodak Bantam. Yesterday I received some colored transparencies back from developing and they turned out beautifully. I believe that I will continue to take more and more colored pictures. They cost more, but the difference is worth it, especially where scenery is involved. That’s why I asked you to buy some colored film if there was any money left over from what I sent to cover the cost of printing the one’s I sent to you. If there is sufficient left to do any of this kind of buying, make sure it is Kodachrome Daylight as that is all I can use until I get a filter. It has turned a little colder for the present, at least, following some badly needed rain. In fact, we’ve had the fire going all day again, after usually only building it in the morning. 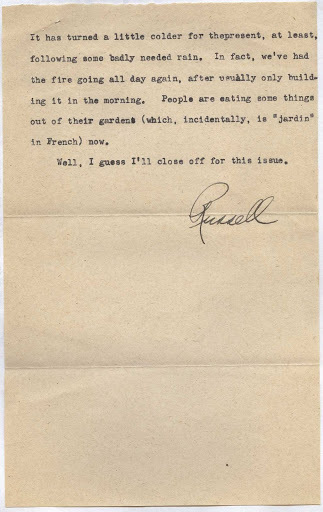 People are eating some things out of their gardens (which, incidentally is “jardin” in French) now. Well, I guess I’ll close off for this issue.